Vintage Racing Club of BC | Mark Brown’s Secret Revealed! 28 Sep Mark Brown’s Secret Revealed! 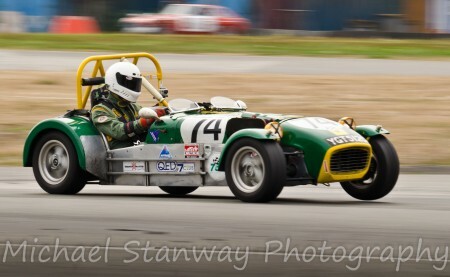 Thanks to some clever camera work by Mike Stanway, we now finally know why Mark Brown is so fast in that dang Lotus Seven of his – he only uses three wheels! The reduction in friction must be worth at least a couple of seconds per lap! Thanks Mike; we are all in your debt. You can look for more of Mark’s secrets on his personal racing web site here. You can check Mike’s Facebook page here.